Dr. Salah-uddin Ahmed’s teaching activities include central nervous system and endocrine systems pharmacology, toxicology, and drug discovery and development. Ahmed’s primary research interest is in testing the efficiency of the active compound in green tea for treatment of rheumatoid arthritis. People suffering from rheumatoid arthritis tend to develop cardiovascular complications, and Ahmed’s research team also is focused on that complication and studies a specific category of small proteins – cytokines – and the cells that are activated in response to them. Ahmed’s research is currently funded by grants from the National Institutes of Health, the Arthritis Foundation, and Roche/Genetech. Ahmed received his Ph.D. from Hamdard University in New Delhi, India. His research focused on nutrition and chemoprevention. Ahmed worked as an associate research scientist in research and development for the pharmaceutical company Zydus Cadila in India. After a postdoctoral fellowship in the Department of Orthopedics at Case Western Reserve University School of Medicine in Cleveland, Ohio, Ahmed continued his research work as a research associate in the Department of Medicine, and then moved to the University of Michigan Medical School in Ann Arbor, Mich., to work as a research investigator and then a research assistant professor in the Department of Internal Medicine where he received his first NIH research grant to study the potential therapeutic properties in green tea and its active molecule epigallocatechin-3-gallate (EGCG). Ahmed moved his research into pharmacology at the University of Toledo College of Pharmacy and Pharmaceutical Sciences in 2009, where he spent five years as an assistant professor. Ahmed joined the WSU College of Pharmacy as an associate professor in 2014. 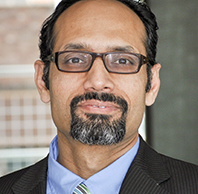 Ahmed serves on several NIH study sections as a grant reviewer and is on the editorial board for the peer-reviewed journals Arthritis Research & Therapy, and Clinical Medicine Insights: Arthritis and Musculoskeletal Disorders. He also serves as an ad hoc reviewer for over 15 other journals including Arthritis and Rheumatism, Biochemical Pharmacology, Toxicology & Applied Pharmacology, Journal of Immunology, and the Journal of Pharmacology and Experimental Therapeutics. Ahmed S. Biological evidence for the benefit of green tea and EGCG in arthritis. Curr. Rheum. Rev. 5: 259-265, 2009. Marotte H, Ruth JH, Campbell PJ, Koch AE, Ahmed S. Green tea extract inhibits chemokine production, but upregulates chemokine receptor expression, in rheumatoid arthritis synovial fibroblasts and rat adjuvant-induced arthritis. Rheumatology 49; 467-479, 2010. Marotte H, Ahmed S, Ruth JH, Koch AE. Blocking ERK1/2 reduces TNF-α-induced IL-18 bioactivity in rheumatoid arthritis synovial fibroblasts by induction of IL-18BPa. Arthritis Rheum 62:722-731, 2010. Ahmed S. Emerging role of green tea polyphenol EGCG in rheumatic diseases. Arthritis Res Therap 12: 208, 2010 [Epub: PMID: 20447316]. Ruth JH, Arendt MD, Amin MA, Ahmed S, Marotte H, Rabquer BJ, Lesch C, Lee SH, Koch AE. Expression and Function of CXCL16 in a Novel Model of Gout. Arthritis Rheum 2010 [Epub; PMID: 20506383]. Jones BA, Beamer M, Ahmed S. Fractalkine/CX3CL1: a potential new target for inflammatory diseases. Mol Interv 2010: 10(5); 263-270. Jones BA, Koch AE, and Ahmed S. Pathological role of Fractalkine/CX3CL1 in rheumatic diseases. Front Immunol 2011: 2; 82. Jones BA, Beamer M, Rahman A, Abu-Alaiwi W, Ahmed S. Role of ADAM17, p38 MAPK, and proteasome pathway in TNF-α and IFN-γ induced synthesis and shedding of fractalkine/CX3CL1 in rheumatoid arthritis synovial fibroblasts. Arthritis Rheum 2013; 65(11):2814-25. Ahmed S, Beamer M, Rahman A, Riegsecker S, Bhansali P, Bellini J, Tillekeratne LMV. Differential effect of a marine-derived class I HDAC inhibitor, largazole, on TNF-α-induced activation of rheumatoid arthritis synovial fibroblasts. Toxicol Appl Pharmacol 2013: 270(2); 87-96. Riegsecker S, Wiczynski D, Kaplan MJ, Ahmed S. Potential benefits of green tea polyphenol EGCG in the prevention and treatment of vascular inflammation in rheumatoid arthritis. Life Sci. 2013: 93(8); 307-12. Cottier K, Fogle E, Fox DA, and Ahmed S. Noxa in rheumatic diseases: present understanding and future impact. Rheumatology 2014;53:1539-46. Ahmed S, Malemud CJ, Koch AE, Athar M, and Taub DD. Cytokines and chemokines: disease models, mechanisms, and therapies. Mediators Inflamm 2014: 296356 [Epub]. Boddu SHS, Alsaab H, Umar S, Bonam SP, Gupta H, Ahmed S. Anti-inflammatory Effects of a Novel Ricinoleic Acid Poloxamer Gel System for Transdermal Delivery, Int J Pharm 2015;479(1):207-211. Umar S, Hedaya O, Agere S, and Ahmed S. Thymoquinone inhibits TNF-α-induced inflammation and cell adhesion in rheumatoid arthritis synovial fibroblasts by ASK1 regulation. Toxicol Appl Pharmacol 2015;287(3)299-305. Singh AK, Umar S, Chourasia M, Riegsecker, and Ahmed S. Regulation of TAK1 activation by epigallocatechin-3-gallate in RA synovial fibroblasts: suppression of K63-linked autoubiquitination of TRAF6. Arthritis Rheumatol 2016;68(2):347-58. Nash KM and Ahmed S. Nanomedicine in the ROS-mediated pathophysiology: Applications and clinical advances. Nanomedicine 2015 2015;11(8):2033-40. Akhtar N, Singh AK, Ahmed S. MicroRNA-17 Suppresses TNF-α Signaling by Interfering with TRAF2 and cIAP2 Association in Rheumatoid Arthritis Synovial Fibroblasts. 2016 J Immunol [Epub]. Fechtner S, Fox DA, Ahmed S. Transforming growth factor β activated kinase 1: a potential therapeutic target for rheumatic diseases. Rheumatol (Oxford) 2016 [Epub]. Mechanism of Fractalkine/CX3CL1 synthesis and shedding in rheumatoid arthritis synovial fibroblasts. Jones BA, Beamer M, Rahman A, Abu-Alaiwi W, Ahmed S. American College of Rheumatology meeting held in November 4-9, 2011 Chicago, Ill. Induction of apoptosis by pentacyclic triterpenoid-rich fraction of apple peels in rheumatoid arthritis synovial fibroblasts. Ahmed S, Fogle E, Beamer M, Trabbic C, Cottier K. 11th International Conference on Function Foods and Chronic Inflammation, August 21-23, University of San Diego, Calif.
Ahmed S, Walsh L, Singh AK, Beamer M, Sudini K, and Leaman DL. Induction of Pro-Apoptotic Noxa Expression By Ursolic Acid Sensitizes Rheumatoid Arthritis Synovial Fibroblasts to Apoptosis: A Role of Mir-181a. American College of Rheumatology meeting held in November 14-19, 2014 Boston, MA. Singh AK, Riegsecker S, Umar S, Beamer M, and Ahmed S. Epigallocatechin-3-Gallate (EGCG) Suppresses IL-1β-Induced IL-6 and IL-8 Synthesis By Selectively Inhibiting TAK1 Activation in Human Rheumatoid Arthritis Synovial Fibroblasts. American College of Rheumatology meeting held in November 14-19, 2014 Boston, MA. Umar S, Hedaya O, Agere S, and Ahmed S. Thymoquinone inhibits TNF-α-induced pro-inflammatory mediators in Rheumatoid arthritis synovial fibroblasts in vitro. Experimental Biology 2015 meeting, Boston, MA. Akhtar N and Ahmed S. Regulation of ASK-1 expression by microRNA-17 and its correlation with rheumatoid arthritis pathogenesis,” at the Annual EULAR meeting in Rome, Italy, on June 11, 2015. Agere S, Akhtar N, Riegsecker S, and Ahmed. Epigallocatechin-3-Gallate (EGCG) inhibits RANTES/CCL5 induced MMP-1 and MMP-13 expression in human rheumatoid arthritis synovial fibroblasts. Experimental Biology 2015 meeting, Boston, MA. Singh AK, Chourasia M, and Ahmed S. Epigallocatechin-3-Gallate (EGCG) facilitates TAK1 nuclear translocation and its interaction with p300 to inhibit histone acetylation in human RA synovial fibroblasts. American College of Rheumatology meeting held in November 7-11, 2015, San Francisco, CA. Akhtar N, and Ahmed S. Characterization of different phosphorylation sites of Mcl-1 in human rheumatoid arthritis synovial fibroblasts and their correlation with RA pathogenesis. American College of Rheumatology meeting held in November 7-11, 2015, San Francisco, CA. Akhtar N and Ahmed S. Regulation of ASK-1 expression by microRNA-17 and its correlation with rheumatoid arthritis pathogenesis. American College of Rheumatology meeting held in November 7-11, 2015, San Francisco, CA. Umar S, Roe G, Fechtner S, and Ahmed S. Pentagalloyl glucose (PGG) exhibits anti-rheumatic activity in Human RA synovial fibroblasts and rat adjuvant-induced arthritis. American College of Rheumatology meeting held in November 7-11, 2015, San Francisco, CA. Agere S, Akhtar N, Riegsecker S, and Ahmed. RANTES/CCL5 selectively induces MMP-1 and MMP-13 production in human rheumatoid arthritis synovial fibroblasts via PKC-δ and JNK pathway. American College of Rheumatology meeting held in November 7-11, 2015, San Francisco, CA. Ahmed S. Salah-uddin Ahmed presented, “Novel targeted therapeutics for regulating synovial inflammation in RA,” for the rheumatology grand rounds at the University of Washington School of Medicine on June 14, 2016. Ahmed S, Haqqi TM. Emerging role of green tea in prevention of arthritis. In: Tea and Human Health (Weisberg J, Siddiqi M, eds.). Cambridge, Mass. : CABI Publishing, pp 172-181, 2006.